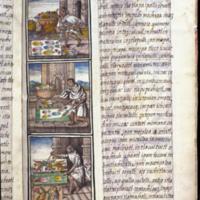 The manuscript page, with writing in Nahuatl along one column and paintings in the other, comes from a twelve-volume encyclopedia called the General History of the Things of New Spain. This chapter and its images refer to pre-Hispanic techniques of feather-working. In each of the three, stacked images, indigenous men demonstrate different steps in the creation of feathered images. This art form, in which thousands of brilliantly colored and iridescent feathers were painstakingly glued to paper or cloth, was unique to the Americas, and 16th-century Europeans marveled at it. The three scenes on this page chart how feather-workers prepared their their materials and created images. In the top one, a feather-worker stands outside, in a European-style patio as he dyes feathers in a caldron. In the center scene, a feather-worker lifts up a cotton fabric with feathers attached. According to the Nahuatl text, these feathers have been hardened with glue. Once the feathers are dry, the maguey-fiber support can be removed from the cotton fabric. At the bottom, a feather-worker applies the final touches to his imagery. The works he has created, a decorative design and image of a saint, make explicit an extraordinary shift in the 16th century. Now feather-working techniques are used to create European images. At the bottom of the scene, adjacent to the image of the saint is a tiny circle, a pre-Hispanic-style glyph representing an eye. In Aztec pictorial language, eye glyphs were used to represent shiny, glistening and sparkling objects, like stars in the night sky and spectacular feather-paintings. The outfits worn by these feather workers parallel those depicted in European woodcuts. Such woodcuts were likely used as models for these images. The text, written in Nahuatl, describes how feather-workers created images in pre-Hispanic times. The top of the page gives the chapter name in Spanish and on other folios a Spanish account of feather-working also appears. This is, then, a bilingual work. Bernardino de Sahagún, a Franciscan friar, who spent much of his life in central Mexico working with Nahuatl-speaking people, commissioned and directed this project. Over several decades in the second half of the 16th century he interviewed elders and other native people in central Mexico, collecting information about pre-Hispanic customs, vocabularies, and modes of ritual practice. To create his General History, he commissioned those fluent in Spanish and Nahuatl to transcribe his writings into this book, and to create images for it. The painters of the General History were Nahuas, well-trained in both pre-Hispanic and European modes of representation. They may have been tlacuilos (scribes) or their descendents. It is most likely they were born to elite families after the Spanish conquest and schooled by Franciscan friars in, or near Mexico City. Some, if not all of them, would have been able to read and write Nahuatl, Spanish and Latin. Today, scholars are not certain of the painters’ names but they would have had close working relationships with Sahagún, and each other, in order to complete this large project. The General History was created with black ink and colored paints on folios of European paper; each page measures ca. 8 x 11 inches. While these three images were probably created by a single person, others were made by different painters. Typically, painters first sketched their images in black ink, then applied colors by hand. Much of their work seems to have been completed in haste, to meet the scheduled departure of a flota sailing from Mexico to Spain in 1580. The General History was many years in the making. It was created under the direction of Bernardino de Sahagún in Mexico City or the adjacent indigenous city of Tlatelolco. The General History was sent to Spain in the late 16th century, although now it is in Florence in the Medici Library and often called the Florentine Codex. An invaluable source about feather working, the Florentine Codex also provides insight into the ways indigenous and European image-making and record-keeping traditions intertwined in the first generations of colonization. The Florentine Codex has bound pages, a type of book introduced to Nahuas by Europeans. It is written in alphabetic script, another introduction. Also from Europe are the style of tunic worn by the craftsmen shown here and images of Christian saints. Indigenous contributions include techniques of feather working—an art that continued into colonial times—as well as memories of pre-Hispanic traditions, and glyphs and the ideas they represent. Estrada de Gerlero, Elena Isabel. 1994. “La plumaria, expression artística por excelencia.” In México en el mundo de las colecciones de arte: Nueva España, Tomo 1. Mexico City: El Gobierno de la República, 72-117. León Portilla, Miguel. 1999. Bernardino de Sahagún: Pionero de la Antropología. Mexico City: UNAM. Translated as: Bernardino de Sahagún: First Anthropologist. 2002. Trans. Mauricio J. Mixco. Norman: University of Oklahoma Press. Peterson, Jeanette. 1988. 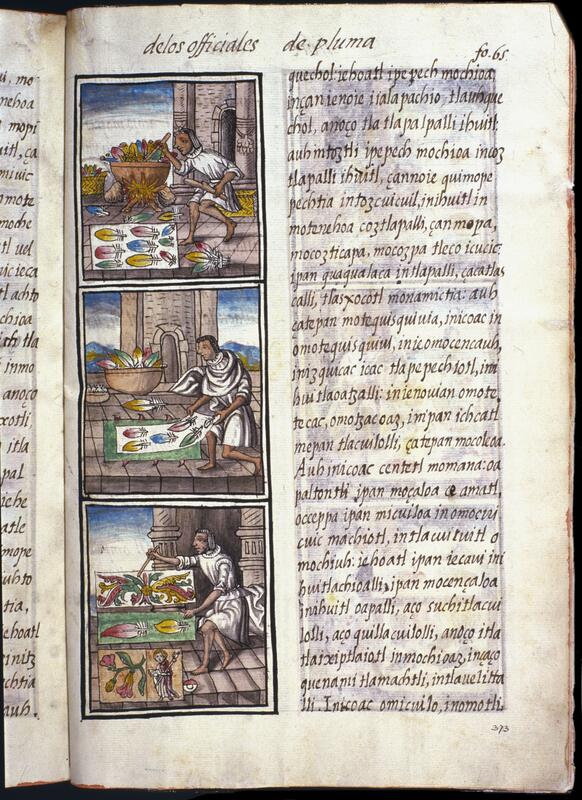 “The Florentine Codex Imagery and the Colonial Tlacuilo.” In The Work of Bernardino de Sahagún: Pioneer Ethnographer of Sixteenth-Century Aztec Mexico. Jorge Klor de Alva, H.B. Nicholson and Eloise Quiñones Keber, eds. Pp. 275-294. Albany, New York: Institute of Mesoamerican Studies. Sahagún, Bernardino de. 1979. Códice Florentino de Fray Bernardino de Sahagún. Facsimile edition. 3 Volumes. Florence and Mexico: Giunti Barbera and the Archivo General de la Nación.